If you’re a fan of Pinterest and you’ve been using it to gather inspiration for your baby’s nursery then you’ve probably seen some amazing modern nursery wallpaper used in a few rooms! Here at Little Residents, we love to create an accent wall or two using wallpaper for baby rooms. Today we’re here to change the cringe feeling that some get when they think of wallpaper from grandma’s house. We also love supporting small business, so we’ve made these selections all on Etsy! I absolutely love the colors used in this modern nursery wallpaper design. It’s a new take on floral, and has a dreamy and whimsical feel. This wallpaper is perfect for the future adventurer! I love the bold blue and green tones used in this pick. This gorgeous, tropical selection is far from average. It’s deep and rich tones set an instant mood that I love! This selection is Scandinavian inspired and perfect for the minimal or gender neutral room! It’s super simple, but eye-catching, especially when used across a larger wall. If your style is a hint of vintage but you think a full vintage floral wallpaper design may be a little too much for a modern nursery, then this decal is perfect! It’s large and can be placed on any wall to give an instant touch of vintage floral. 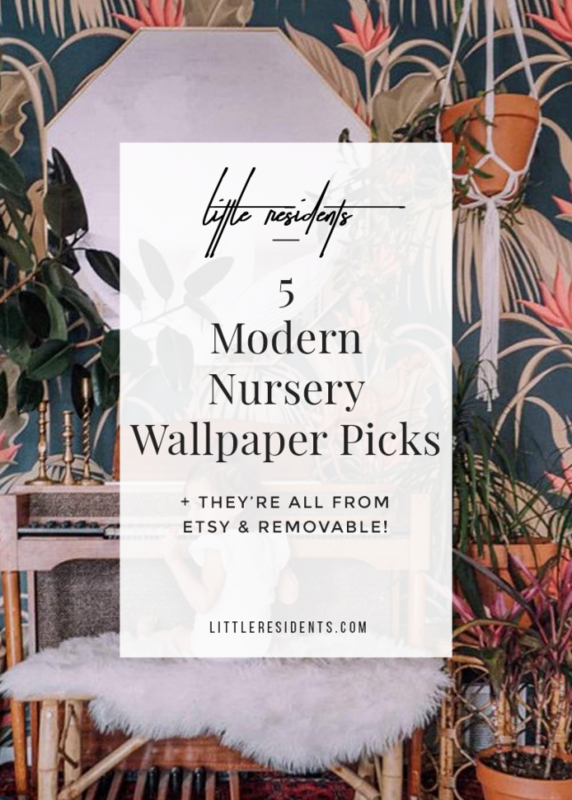 Do you have any favorite modern nursery wallpaper picks? Feel free to share in the comments below!